Weeders Digest is excited to introduce our newst addition to our emergency tire traction line of products. TruckClaws II™ is the Emergency Tire Traction Aid of choice for Light Duty Trucks, Pickups, RV and SUV Owners. This Traction Aid can even be installed over conventional Tire Chains and Snow Chains. We get your Truck Unstuck from snow, ice, mud and sand! For Trucks with a GVW rating of 40,000lbs or more please check out our TruckClaws ™ Commercial Truck Version. Truck Claws ll are for use on Light Commercial, Pickup Trucks and SUV's. We highly recommend purchasing the optional Extender Bar that can be used in extreme situations to assist in grabbing more ground and giving even better traction. This invaluable product is one of the best investments for any driver that travels in winter weather or in muddy environments. No more getting stuck and not being able to get free. Save TIME & MONEY by eliminating expensive tow trucks and lost time. The durable, heavy duty emergency traction product is better than snow chains and much easier to use. Each Truck Claw ll package includes two traction claws and installation instructions in a carry bag for a affordable price. Truck Claws will save you time and money when you find yourself stuck and need help to get going again. TruckClaws II™ is a traction aid developed for light commercial trucks, pickups, RVs and sport utility vehicles with a GVWR of 30,000 lbs or less. TruckClaws II™ is an aluminum traction cleat that is installed on a tire with a customized strap and ratchet. The cleat is designed with a channel to accommodate an extender bar that slides into place to provide additional traction under extreme conditions. TruckClaws II™ is effective in mud, ice, snow and sand. The average person can install TruckClaws II™ in less than 60 sends per traction aid. Can TruckClaws II™ be installed after the vehicle is stuck? Yes. 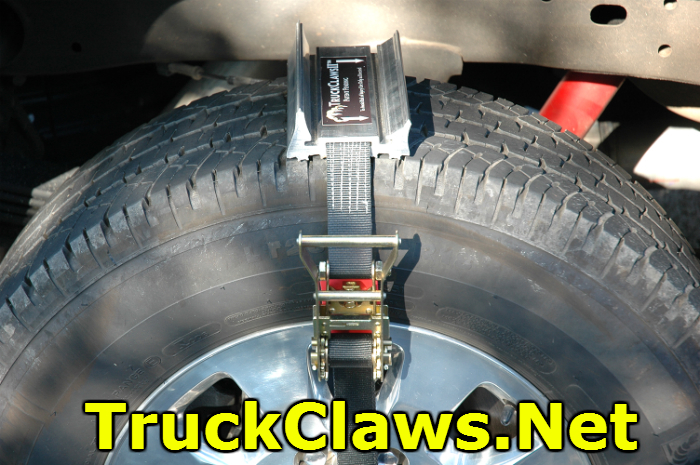 Unlike tire chains, TruckClaws II™ can be installed after the vehicle is stuck. Can TruckClaws II™ be used for continuous driving? No. TruckClaws II™ should only be used to get your truck unstuck. After your truck is unstuck, stop and remove them immediately. Can TruckClaws II™ be used as a braking aid? No. TruckClaws II™ should not be used as a breaking aid driving up or down hills. The product is made to get your vehicle unstuck. Can TruckClaws II™ damage the truck? To avoid damage, verify that there is adequate clearance between the wheel and inner wheel well and use them according to instructions. Can TruckClaws II™ be used on one tire only? No. Traction claws should be installed on both left and right tires. How many TruckClaws II™ should be installed on a 2-wheel drive vehicle? There is only one choice which is to install TruckClaws II™ on each rear tire. In most cases, one claw on each rear tire is needed; however, two claws on each rear tire can be installed to enhance traction to power your way out. Watch web site videos for examples. How many TruckClaws II™ should be installed on a 4-wheel drive vehicle? There are several ways of using TruckClawsII on a 4-wheel drive vehicle. In most cases, one claw on each rear tire is needed; however, two claws on each rear tire can be installed to enhance traction to power your way out. Another option is to install a claw on all four tires. Watch web site videos for examples. WARNING!! THE EXTENDER BAR CAN NOT BE USED ON THE FRONT TIRES OF ANY VEHICLE. Make sure that there is adequate clearance between the wheel and inner wheel well and use them according to instructions. Will TruckClaws II™ work on any truck or SUV? TruckClaws II™ should work if your vehicle has the proper clearance between the wheel and fender well, there is an opening in the tire rim for the strap to pass through, and the brake calibers are cleared. What is the extender bar and when should it be used? The extender bar is an accessory that slides into the traction cleat to provide an additional 10 inches of traction past the width of your tire tread. Extender bars should only be used after you have tried unsuccessfully to get your vehicle unstuck using the traction plates alone. NEVER INSTALL THE EXTENDER BAR ON THE FRONT TIRES OF A VEHICLE. The extender bar kit is sold separately from the TruckClaws II™. How many TruckClaws II kits is needed? One kit is needed for most conditions. For the serious off-roader, two kits is suggested. Will TruckClaws™ work if I have the smaller holes in my rims? Yes, you just curl the strap up to thread it through the hole in the rim, then pull it through and it will work the same as the larger holes. Installing one claw on the right and left drive tires is recommended in most situations but you will get two claws just in case you need them both! If your ready to order you can call us 7 days a week or place your order online!